Located in Welwyn Garden City off London's M25 motorway, Colt's London 3 isn't your average co-location data centre. A facility with a twist, the company claims that its modular hall design allows it to provide co-location and managed infrastructure services in a more flexible and cost-effective manner than traditional data centres. And it should know: the company owns 20 data centres in 10 different countries that rack up a total of €112 million (around £88 million/US$150 million/AU$160 million) in revenue per year. In May, Colt provided London 3, a Tier 3-rated facility, with an additional 1000 metres squared of data halls, bringing the total space inside to 6,500 metres squared. Featuring a total of 11 data centre halls, a range of companies take up its services - from cloud service providers to financial institutions. Colt builds the data centre outwards into its warehouse, which provides a total of around 13,500 meters, a capacity that could be filled in around three years, according to Colt. The data centre features two on-site substations providing resilient power of 33MVA, a seven-layer security setup that wouldn't look out of place at Fort Knox and full 24-hour accessibility, even in the event that the M25 went on emergency lock-down. Because when that impending zombie apocalypse hits, you want to be making sure those servers performing, right? Colt pitches the facility as an attractive option to IT departments that are subjected to growing demands on increasingly shoestring budgets. In the first of a series of insights into some of the UK's most innovative data centres, TechRadar Pro talks to Matthew Gingell, head of Strategy and Business Development at Colt, and Paul Keleher, technical specialist at Colt, to find out more. 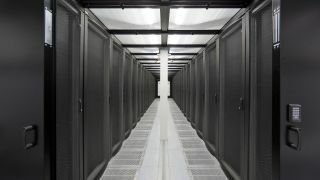 TechRadar Pro: What are the advantages of a modular data centre design over a traditional one? Matthew Gingell: The key advantage has to be flexibility and the ability to map supply with demand. Following the decision to build you can put another megawatt (or two) in at a time without having to have a construction team on site. You can do that by bringing in prefabricated modules that you know will work because they're the same as the ones next door, so it's almost like putting in another Lego block, turning it on and off you go. That's the most fundamental advantage. Other advantages from a technical point of view include the ability to change the specification of each module. You can learn as you build out, so each module can be built out cheaper than previous ones, or they can include alternative, more economic designs as you build out. On the module side, the whole building will be built from scratch over the course of about five years. If you started building it up front, you're going to be dealing with something that's five years old by the time you're putting the last bit in. TRP: Why did you decide to build the data centre outside of the M25 ring road? MG: Being outside the M25 is an advantageous location because it's close enough to provide good latency characteristics between the city and here, so you can put applications in both of those places. It also allows us to have a data centre of this type and size because it allows you to have a very large warehouse that you can then build out in a modular fashion. You couldn't do that if you were stuck in the middle of London; we can't do that at our site in the city. I think they're some of the big advantages: it's a very well-connected location, so connectivity is very good here, and it meets a certain requirement for the types of applications that you can put in here, which vary from the back office of a very large bank all the way through to the online presence of a large cloud provider. TRP: The data centre is certified to Tier 3. Is that as a whole operation, or on a per-module basis? And do you have any plans to go to Tier 4? MG: Tier 3 is the right level for the types of business applications that we're looking for. Tier 4 is actually very rare as it's so expensive, and the ones that have been built even here in the UK are not being used for what they were originally created for. Having said that, the modular approach we've got here would allow us to build modules at different tiering levels, so we could built a Tier 2, although I don't think we'd ever want to build a Tier 1 because it would be a pain to operate. If a company came and asked us to build a hall at Tier 2 or Tier 4, the modularity allows that flexibility, but typically Tier 3 is where you need to be. We call it Tier 3 "plus", though that's our own terminology as we build in additional redundancy on cooling that's not technically required.